Tag Archives: Miguel A. Nunez Jr.
"I think I'll just stand here until you drop dead. Ya'all okay with that?" A New Beginning is bad…but there’s more to it than that. Yes, it’s The One Without Jason, but it’s also the one without standards, any regard for pace, storytelling, or even its own audience expectations. It’s the one that threw the series over a bridge. 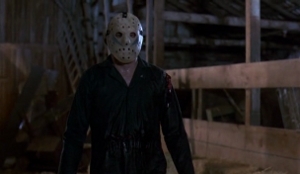 The point where casts and crews stopped even pretending to care about quality and settled for last place in the Generic Slasher Movie Olympics.